I've been craving chicken drumsticks lately (I love dark meat chicken). I was thinking about how great the Roasted Sweet & Spicy Chicken Legs were, and that I needed another unique chicken drumstick recipe on the blog. My boyfriend and I made these for dinner last night and they were a winner! 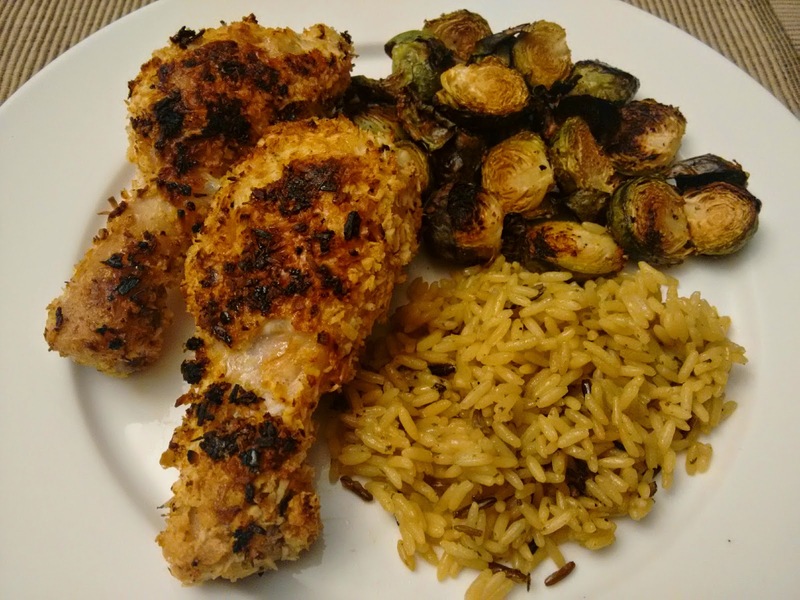 We served them with wild rice and roasted brussels sprouts (my favourite vegetable). You can use any type of breadcrumbs, but Panko stay very crispy and provide a crunchiness similar to a deep fried breading, even though these are oven baked. Preheat oven to 375 degrees F. Line a baking sheet with aluminum foil and grease with Canola spray. In a medium bowl, combine eggs and lime juice then scramble. Combine coconut, breadcrumbs, chili flakes and lime juice in a second bowl and mix. Dredge each chicken drumstick in egg, and roll in coconut breadcrumb mixture. Place each drumstick evenly spaced on the baking sheet. Place in the oven for 40-45 minutes, turning chicken legs over halfway through.